Are you often tired for no reason, feel stressed out and run down, have trouble getting up in the morning, or need caffeine, sugary or salty snacks to keep going? These are all symptoms or indications of adrenal fatigue, which you may be suffering from if you answered “yes” to one or more of these questions. There are a number of lifestyle changes you can make to overcome adrenal fatigue, starting with the regular consumption of healthy smoothies containing ingredients known to support the adrenals. Below I’ve listed the top smoothie ingredients that nourish the adrenals, most of which are adaptogens. Adaptogens increase the ability of an organism to adapt to environmental factors (stress, diet, toxins, disease, etc) and to avoid damage from such factors without causing any side effects from its use. In English, they help the body adapt to stress. Maca: One of the ultimate energy boosting superfoods, maca can reduce the effects of cortisol on the adrenal glands (and other organs) caused by stress from work, disease, exercise, PTSD, a high pressure lifestyle, or any other factor. Maca helps alleviate mental, emotional, and physical stress on the body. It also increases stamina, endurance, and strengthens the immune system while acting as a powerful adaptogen. For more information on one of my favorite superfoods, see my epic post on maca. Eleuthero Root or Siberian Ginseng: One of the most popular adaptogenic Chinese herbs, ginseng has traditionally been used to strengthen, nourish, and stimulate the adrenal glands. Herbalists often prescribe ginseng to treat fatigue, stress, and lethargy. Not only does ginseng help reduce stress, but also boost energy levels, improve endurance, increase mental alertness, and enhance the immune system. The ginenosides found in ginseng are what helps to counteract adrenal stress. Ashwagandha: Popular among Indian Ayurvedic practitioners, Ashwagandha has traditionally been prescribed to help relieve stress and strengthen the immune system after an illness. It’s often referred to as Indian ginseng because of its adaptogenic and tonic effects. Ashwagandha helps normalize and balance adrenal hormone levels, which is very beneficial to those suffering from adrenal fatigue. Ginger: While not as powerful as the herbs listed above, ginger is also an adaptogen that helps normalize adrenal hormone levels. Green Tea: An adaptogen in its own right, green tea supports the adrenal glands to help reduce stress. Green tea also helps reduce depression and anxiety by aiding the nervous system. Nettles: The abundance of vitamins and minerals in nettle tea is very nourishing to your adrenals. 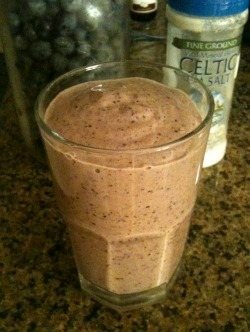 Sea Salt: An easy smoothie add-on that’s often overlooked is a dash of a high quality salt, such as my favorite, Celtic sea salt. Here’s a great article on salt and adrenal fatigue. A few other substances known to support the adrenals that you are free to research on your own include Wild Yam, Rhodiola, and Cordyceps. Other lifestyle changes may be needed to overcome adrenal fatigue as diet alone might not be enough. Reducing stress in your life, getting plenty of rest and a good night’s sleep, walking and other low intensity exercise, reducing your exposure to toxins, and doing some detoxification work are all helpful in putting adrenal fatigue in the rear view. I didn’t know it at the time, but several years ago I suffered from a mild case of adrenal fatigue. Getting up in the morning for work was a real chore, and my energy levels had definitely tapered off from my earlier years. I turned things around by improving my diet, with smoothies being one of my key upgrades. The adrenal boosting smoothie ingredients should be integrated into your current smoothie regimen at your own pace. As is the case with any new supplement or vitamin, start off with a small dose and work your way up. If the ingredients above are all new to you, start by integrating one at a time into your smoothies, and diet. Depending on your current state of health you may want to consult your health care provider before using the more potent herbs ginseng and ashwagandha. If you don’t have a source for any ingredient listed above, I recommend Mountain Rose Herbs. Edit: the original recipe called for 1 fresh banana, which I have since replaced with 1/2 avocado. Foods high in potassium can worsen adrenal fatigue – bananas, melons, dried figs, dates, raisins, oranges, etc. Additional superfoods such as cacao, goji berries, coconut oil, bee pollen, and spirulina. Place all of the ingredients into your blender and blend for around 30-45 seconds or until your desired consistency is reached. Let me know what you think of this adrenal support smoothie by leaving a comment below. Happy Blending! Thanks so much for this one Ryan. I need to pick up the herbal ingredients you suggested so I will check back in a week or 2 from now when I have all I need to make th drink! I linked into the mountain rose herbs website. Do you have an opinion regarding this supplier compared to longevity warehouse? I am new to herbalism so not familiar with best options for quality products. Any insight is appreciated, and thanks so much for your help on this smoothie!! David Wolfe’s longevity warehouse has excellent products as well, but I find Mountain Rose Herbs generally has the lowest prices. The Raw Food World is another good online retailer. Where you purchase the superfoods and herbs from is totally up to you – you can’t go wrong with either of the three previously mentioned. Good luck with the smoothie and I look forward to hearing how works for you. Bananas are a big NO NO for adrenal fatigue as they are high in potassium which is already too high in patients suffering from adrenal fatigue!! That’s new information to me, thanks for bringing it to my attention. There does appear to be a link between excess potassium and adrenal fatigue. Although one banana only contains around 12-13% of the daily recommended amount of potassium. Nevertheless, I’m going to modify this recipe to exclude the banana. I just read in a book called, How Not to Die, by Michael Greger, MD. (A longtime trusted source for me.) As far as bananas as a source of potassium, they are low. You’d have to eat 12 a day to get the minimum recommended amounts. Of the foods tested, bananas came in ranked at 1,611, just below Reese’s Pieces. I love avocado in smoothies too, but I wouldn’t worry too much about bananas. It’s interesting how foods are known to contains high amounts of certain vitamins or minerals when in fact they contain very little. Another example is oranges being high in vitamin C, when in fact they contain very little. Marketing and advertising spreading falsities. Avocados ate also high in potassium. Do you have nutritional values for this smoothie? Would appreciate knowing calories, fat, protein, carbs, & fiber. I’m sorry, but I don’t have the nutritional breakdown for this or any of my smoothies. Mainly because I’m lazy ;), but also the difference between conventional, organic, local, and wild produce. This website: http://nutritiondata.self.com/ as well as several smart phone apps including Calorie Count can provide that information for you. I have been reading up on adrenal fatigue and a lot of people are saying to stay away from green tea because of the caffeine. But like you said, and I’ve read in other places, it is recommended because of its adaptogenic properties. Could you clear that up for me? Would be much appreciated. Thank you! Like with most things I think moderation is key. One cup of green tea a day isn’t a substantial amount of caffeine, and you can opt for green teas that are naturally low in caffeine. That said, caffeine affects everyone differently. I’m pretty much immune to caffeine while my brother can take two sips of coffee and feel jittery for an hour. Pay attention to how your body reacts to caffeine. There are also plenty of other non-caffeine herbal teas to choose from. Hope that helps. Is there a non-caffeine tea this is particularly good for the adrenals? You could try a non-decaf green tea or nettles tea. Is tofu good for the adrenals? I have recently been using tofu instead of yoghurt into my smoothies with banana and it’s nice. If tofu is good, what fruit can I use with it instead of bananas? Avocado is good substitute for banana.